We recently sponsored one of our Technical Managers' participation in a charity boxing match to help raise funds for Cancer Research UK. As Oxfordshire's largest independent heating and plumbing company, we believe it's important to be active and involved in the local community and support our staff in their charitable endeavours. Terry Anderton, a Technical Manager here at M&N Heating & Plumbing, signed up for Ultra White Collar Boxing - the fastest growing corporate contact sport organisation in the world. 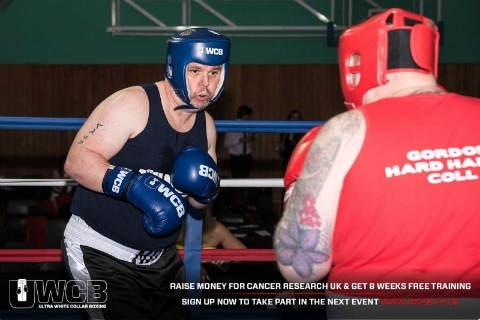 Terry opted to participate in a UWCB event, as their chosen charity, Cancer Research UK, is close to his heart. Terry's father-in-law has been bravely fighting prostate, pancreatic and stomach cancer for over four years. All UWCB participants are complete beginners that want to raise money for charity, improve their fitness and do something amazing they'll remember forever. Terry completed the intensive eight week training programme at his local gym with professional boxing coaches. After this, he was matched with an opponent based on weight, fitness, ability and age to ensure a fair, competitive bout on 10 April 2016 in Milton Keynes. It wouldn't have been a proper boxing match without a ludicrous ring name and catchy entrance music, with "Two Tonne Terry" opting for Chas & Dave's Gertcha. In the blue corner with his father-in-law's name, Mike, embroided on the waist band, Terry fought like a hero. In a hotly-contested fight, the judges were left undecided, resulting in a split decision. Personally, we thought he should have won! Whilst UWCB participants are only required to raise £50 for Cancer Research UK, Terry raised an incredible £651.25! 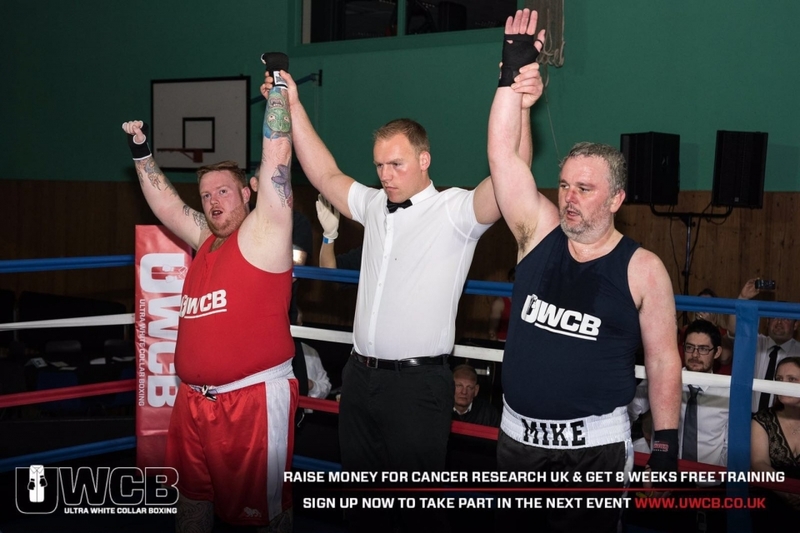 With other boxing matches scheduled throughout the evening, UWCB raised over £20,000 for Cancer Research UK. For more information about UWCB, visit the website or check them out on Facebook or Twitter.